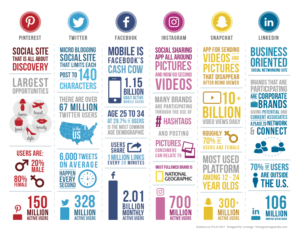 This social media infographic lays out the differences among the 6 major social media platforms. This can help you quickly identify which social media tools to leverage for your company or website. 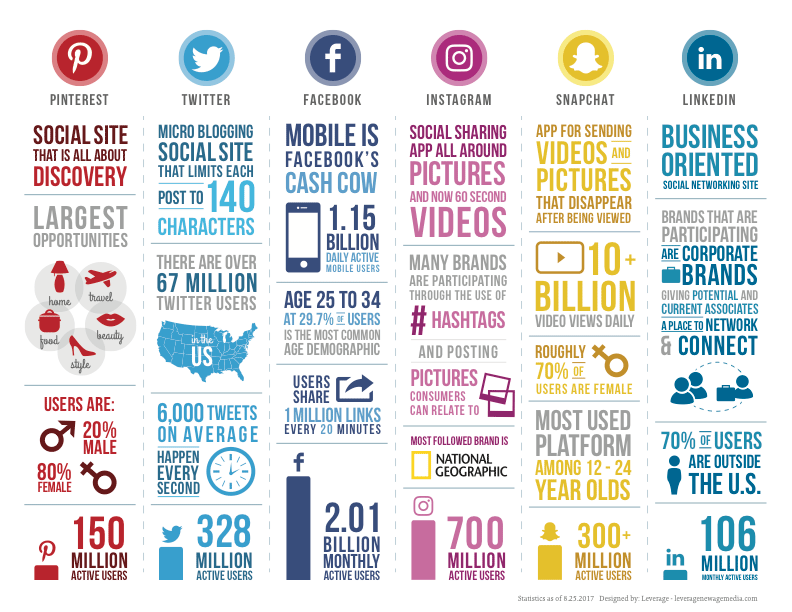 An agency called Leverage New Age Media put this infographic together for users to easily distinguish among the different social media tools. If you work for a company or are building your brand, take advantage of this knowledge to amplify your marketing efforts. Pinterest – images focused. typically geared towards females. All about discovery. Twitter – microblogging. Very active users. Facebook – very active mobile users. Biggest reach out of all social media platforms. Instagram – images and videos focused. Large user base. Snapchat – focused on images and videos that disappear after being viewed. Geared towards females and younger population. LinkedIn – focused on business professionals. Very active user base.